There are many styles of COPIC nibs that can be used to achieve different effects with your COPIC markers. There are also replacement nibs for the original COPIC tips so you can refresh your markers if the tips become worn or frayed. 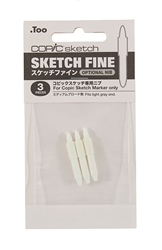 These particular nibs are for use with COPIC Sketch markers only. There are five Medium Round nibs per packet. This firm, bullet-point nib gives you an even, medium-size stroke. Ideal for comic artists and cartoonists. Ordered more nibs which are competitively priced! Thanks Itakufuel for the amazing service and fast shipping!